Are you interested in learning what an oncology nurse does? If you are studying nursing and are interested in specializing in a field of nursing, it is important to review all of your options. An oncology nurse practitioner will work closely with oncologists to treat patients who have cancer and educate their families on treatment options that are available. As a skilled specialist, an oncology nurse will work as part of a multi-disciplinary team. Read on, and learn more about the duties and responsibilities within this specialty field of nursing so that you can decide whether or not this is the field for you. important for the nurse to listen to the patient to assess their emotional of state and their physical state. In addition, an oncology nurse will also educate the patient and their family about their disease at possible treatment options. They must have an in depth knowledge of cancer treatment and side effects so that they can give the patient all the information that they need to make future decisions. Since they work in such a sensitive setting, they must be sensitive to patients needs as they coordinate tests and cancer treatments. These nurses will work with physicians, oncologists, equipment technicians and other registered nurses in a variety of settings. Where Do Oncology Nurses Work? 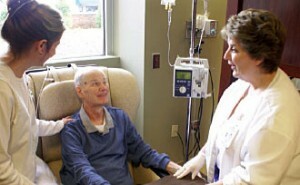 Oncology nurses can work in many different health care settings. If you want to specialize in oncology, you should know about the settings that you could potentially work in. You may work and an acute care hospital, a private oncologist’s office, and ambulatory care facility, a community health care agency, a radiation facility, a surgical center, or a home health care agency. You have the option to pursue a position in an inpatient or outpatient facility, and your duties and hours will depend on this factor. It is important to compare salaries in each setting, the demand in the field, and trends in job openings in your area to determine which options are most practical for you. To become and oncology nurse, you will first need to study to pass your registered nursing examination. You must have a nursing degree or a bachelors degree in nursing before you can sit for your exam. After you are registered, look for an opening where you can get and hands-on experience with cancer patients and treatment options that are currently available. As you are gaining your professional experience, it is it your interest to get certified through the Oncology Nursing Certification Corporation. This certification will help you a qualify for open oncology positions. There are several different specialties that you can pursue in nursing. You must consider the environment that you will work and the types of patients that you will care for, and whether or not you can handle an emotional state before you consider the specialty. Now that you know what an oncology nurse does, you can decide if this is the right path for you.